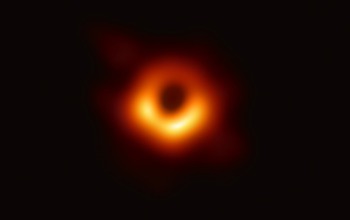 The first image of a black hole. Credit: Event Horizon Telescope collaboration et al. What do relativity theory, quantum mechanics and retirement planning have in common? Not a lot and that's actually an important point. Black holes were implied by Einstein's work on general relativity in 1915 but the first one wasn't discovered until 1971. Physics was able to predict the existence of one of the largest elements of the universe 56 years before one was discovered. At the other extreme, on the quantum scale, Peter Higgs and five other scientists proposed the existence of the Higgs boson in 1964. Its existence was confirmed in 2012 based on collisions in the Large Hadron Collider at CERN. The existence of the Higgs boson was predicted 48 years before it could be confirmed. In retirement planning, we do well to predict finances somewhat accurately more than a year or two in advance. Retirement planning is clearly not rocket science. Physical sciences and their predictions are based on physical laws of the universe. Acceleration due to gravity on Earth is about 9.8 meters/second2, or about 32 feet per second per second as we Boomers learned in high school physics back when a meter in the U.S. was something one paid a quarter to park. On Mars, it's about 3.7 m/s2. Light travels at about 300,000 kilometers/second. Drop an object from a height of 10 meters on earth and we can predict that it will reach the ground in 1.43 seconds traveling at 14 meters/second at impact. We can build models that predict such things with great accuracy. Economics, however, is a social science, not a physical science. Finances can be modeled mathematically but actual outcomes are highly dependent upon the behavior of the humans involved. That makes the models far less predictive. Unlike the universal laws of physics, the inputs for financial models are often unknown, so we make our best guesses. The most important factor of retirement finance, how long you and your spouse will live, is largely unknowable. Half of a group of people like you may live another 18 years but you might live twice that long or get hit by a bus tomorrow. We know that stock markets have returned about 9% a year over the past 150 years but you won't be retired for 150 years. The geometric rate of market return you would have historically experienced over any single 30-year retirement during those 150 years could have been less than 3% per year or more than 10%, depending on the year you retired. The range of returns is broader for shorter periods.